A full vehicle convoy made the journey. Last month, NASA took a key component of its $96.6 million Ice, Cloud and land Elevation Satellite-2 (ICESat-2) on a cross-country road trip. That component, called the Advanced Topographic Laser Altimeter System (ATLAS), is a laser that measures precisely how long it takes for light particles to bounce off the Earth and return to the satellite. ATLAS was designed, constructed, and tested at NASA’s Goddard Space Flight Center in Greenbelt, Maryland. But it needed to travel some 2,000 miles to reach the Orbital ATK’s facility in Gilbert, Arizona, where it will be attached to the ICESat-2. Previously, NASA has flown equipment from one side of the country to the other — the Curiosity rover, for instance, took an Air Force C-17 transport plane when it traveled from California to Florida prior to its 2011 launch. However, the Smart Car-sized ATLAS required special procedures to ensure it arrived intact, which meant flying was not an option. NASA technicians attached probes to the laser in order to monitor its temperature, humidity, and the strength of vibrations affecting it throughout the journey. ATLAS was then wrapped in two layers of anti-electrostatic discharge film to prevent shocks. A full convoy made the journey: A scout car that checked for accidents or debris, the transport truck that followed a quarter-mile behind, a trail vehicle, and other support cars. The journey was further complicated by convoy logistics — the group couldn’t drive through state capitals or large cities at rush hour, they couldn’t drive at night without special approvals, and they required further permits for certain stretches of road. The high maintenance road trip lasted more than four and a half days. Quality assurance personnel and technicians traveled in a support car, monitoring the environment inside the truck in real-time. ATLAS is so sensitive that they needed to adjust the interior airflow to ensure that dust particles didn’t settle on the instrument. 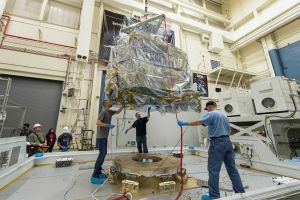 Now safely in Arizona, ATLAS will soon be mounted on the ICESat-2 and undergo further testing before the completed satellite is delivered to Vandenberg Air Force Base in California and sent into orbit.